This class analyzes T2-MI (DVB-T2 Modulator Interface) from TS packets. TS packets from the outer transport stream are passed one by one to the demux. The signalization is analyzed. Services with at least one T2-MI component are signaled to a handler. A T2-MI component is spotted by the presence of a T2MI_descriptor in the PMT. The application decides which T2-MI PID's should be demuxed. These PID's can be selected from the beginning or in response to the discovery of T2-MI PID's. 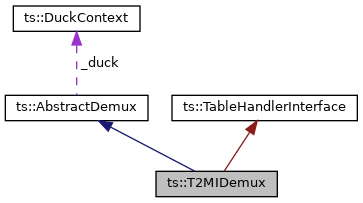 [in] t2mi_handler The object to invoke when T2-MI information is found. [in] pid_filter The set of T2-MI PID's to demux.